The Miami Herald has a story about Cuban American lawmakers beating back efforts to ease sanctions against Cuba. Further, they are embarking on a world tour to browbeat other countries to isolate Cuba. This includes a trip to Latin America. This is yet another great example of how U.S. policy toward Latin America is shortsighted and self-centered. Effective policy would mean addressing issues of mutual concern, which Cuba is not. Instead, you can easily envision the scene—Mario Díaz-Balart and others find the few countries in the region that will accept their anti-Castro delegation, probably Colombia, Guatemala and El Salvador, while everyone else shakes their heads in disbelief and Hugo Chávez serves up some choice insults. Subsequently, there will be much plaintive wondering why Latin Americans don’t appreciate U.S. policy. Does anyone out there know what the address is for the FSLN website? I had an old link (www.fsln-nicaragua.com) that no longer works. They must have a site, but I can't find it. More rough times for Bachelet. The widely publicized labor protest (which also took place in other Chilean cities, though seemingly without the violence) was especially notable because it included members of her own party—for example, Senator Navarro was attacked from behind by police. But here’s a curious fact. A recent (early August) poll shows her with a 51% approval rating (same as in July) and her disapproval actually dropped from July (down to 38% from 41%). Despite the intense criticism, she clearly has a base of support that remains solid. She needs to get that base energized somehow, since it has been largely silent. I am chairing a panel at LASA on Wed. morning that will analyze the Bachelet government in a number of different areas—military, education, gender, executive-legislative relations, social security, and labor. It should definitely be an interesting discussion. Granma published another article by Fidel. Like other recent articles, it wanders, even intertwining history with the present, written by an older man who clearly relishes the fact that he has outlived so many U.S. presidents. The second and third paragraphs focus on Eisenhower, and how Fidel and Che Guevara went to play golf as a way of making fun of him. The article veers up to Bill Clinton and the passage of Helms-Burton, then to the current presidential candidates, then back to Jimmy Carter and his attitude toward Panama, on to the talk of a Hillary Clinton-Barack Obama ticket, then to speculation that Al Gore might run. The general theme is that Cuba policy doesn’t change much with Democrats or Republicans, with the exception of Carter. Nostalgia is exactly the feeling I got from this article. It is, however, also timed to quash speculation that he is dead, though no photo accompanies it so the rumors will likely continue to run rampant. Almost exactly a year ago I wrote about how Uruguay seemed to be part of a new non-aligned movement. Not much has changed since then, which is all good for Uruguay. Yet at the same time, in the first half of 2007 Uruguay was the fastest growing market in Latin America for U.S. goods. President Bush was in Uruguay earlier this year, discussing free trade and investment with President Vázquez. I know that the Frente Amplio is split on whether to pursue a free trade agreement with the U.S., but I would imagine Vázquez can use that to his advantage when talking to U.S. officials. For now, he gets attention from Chávez and more access for Uruguayan goods in the United States (even, at least for now, without signing an FTA). The LA Times notes the complaints that the border fence is not going quickly enough—no surprise that Duncan Hunter is among the loudest. You may remember the Secure Fence Act, which called for the fencing. A grand total of 15 miles of fence has been built, and I’m including the photo from the story so everyone can decide for themselves whether it looks like a deterrent. In general, though, I think it is fair to say the administration is dragging its heels, as there is considerable opposition to the fence. But construction couldn't begin, officials said, until more effective fencing could be designed, contractors hired and environmental issues addressed. Outside Yuma, for instance, the fence is being built with small holes to allow movement by the horned lizard. The government also has met with opponents of the plan. "The administration has made the decision to address local land concerns and environmental concerns to the extent that they can. . . . It slows the process down, but we're still committed to getting it done. 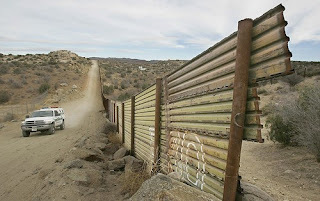 Ultimately, the goal is to secure the border," said Brad Benson, a spokesman for Customs and Border Protection, the agency responsible for the fence. Miguel links to an article he wrote about eliminating term limits, focusing especially on Bolivia. Although I don’t agree with everything in his analysis, it puts the issue in more analytic perspective. The debate has been almost entirely hot air and largely accusatory, with Chávez supporters touting the proposed change as truly democratic and Chávez opponents saying it is about dictatorship. Both see their arguments as self-evident. --Chávez supporters rightly point to France, which has no term limits. We need to ask why that has not produced abuse there. In general, Chávez supporters label critics as hypocrites because they fail to address similar situations elsewhere (Uribe is a common example) and I think this is a legitimate criticism. --We also need to analyze the effects of indefinite election elsewhere. When does it increase corruption, abuse of opponents, etc.? What is the political context within which abuses emerge? There must be studies of this somewhere. --Miguel rightly points out that incumbents have a huge advantage, and in the Venezuelan case Hugo Chávez has increased state control in a number of areas, and so with each election will have far more resources than any opponent. On the other hand, he also has won large majorities and clearly is popular. To what degree can we separate artificial advantage and real popularity? --there is a large literature on term limits and legislatures, with regard to issues like accountability. To what degree can those insights be applied to presidents? --A final important question, related to all of the above: under what circumstances does an incumbent president lose an election when there are no term limits? How does that context change when the president is seeking a second, third, fourth, etc. term? On official Cuban television, there was no hint of trouble Friday. A rerun of the hit NBC series "Friends" played late in the afternoon. Is the message that Castro can’t be dead if Cubans are watching David Schwimmer? Anyone who expected the Democratic takeover of Congress to make a difference on Cuba must have been hallucinating. House Democrats have done everything possible to show they can match anyone for blind obstinacy. I have no illusions about this prompting any policy change regardless of who is elected, but the mere existence of a national debate about Cuba policy is welcome. Judge John R. Downey of State Superior Court, Gov. M. Jodi Rell’s nominee for the State Appellate Court, withdrew his name from consideration on Wednesday after court transcripts showed that he had mistakenly claimed that only legal residents could use the court system. Yep, even judges may believe that if you are not in the country legally, then you have no legal rights. His nomination was withdrawn, also in part because a few years ago he talked about what a great guy Strom Thurmond was. A quick non-Latin America update. Steven Taylor’s post on California’s debate about the Electoral College prompted me to figure out what had happened here in North Carolina, where a similar debate was occurring in the General Assembly, albeit with almost no media attention. The Senate has passed, and the House soon (maybe even today) will vote on a reform that would grant one electoral vote to the candidate who wins each congressional district (a total of 13) and then the final two votes would be given to the candidate who wins statewide. The proposed changes would have serious implications for the 2008 presidential election - so much so that Howard Dean, the chairman of the Democratic National Committee, intervened behind the scenes in North Carolina’s debate last month. A controversial bill to change the way that the state allots its Electoral College votes had already passed in the N.C. Senate and appeared to be on the verge of passing in the House. That’s when Dean made a phone call to the state chairman of the Democratic Party requesting that North Carolina Democrats postpone the bill until next year. The rationale seems to be that although the reform would help Democrats in NC, it would help Republicans in CA, and Dean did not want NC to start a trend that would end up hurting the 2008 Democratic candidate. So the reform is shelved until it will no longer affect the 2008 election. This year UNC Charlotte is experimenting with a book for freshmen to read—next year the program may be expanded to all new students. I decided to check it out: The Color of Water, by James McBride. It is a really cool book, and I highly recommend it. I’ve put it on the sidebar. It is McBride’s memoir, and although I had never heard of him (he is in fact a talented musician) I was drawn in immediately. His mother is white (and Eastern European—her own mother spoke no English) and grew up Jewish, the daughter of a rabbi in Virginia. She made her way to NYC, where she converted to Christianity and eventually had 12 children with black men. Her two husbands died tragically of natural causes. So McBride grew up poor and had intense internal debates about race. Some chapters are his mother’s voice, as he recorded her talking about her life. She faced her own struggles, because a white woman could not safely fall in love with a black man in 1930s Virginia, and once she eventually married, her entire family disowned her. Despite isolation, poverty, etc. he makes a point of showing how effective her parenting was, so that all 12 children became successful, going to college, medical school, and excelling in various ways. It is ultimately a story about triumph, but he is a good writer so it is never cheesy. He's coming to speak on campus in October, which should be really interesting. The presidential candidates obviously always have an eye on Florida, and suddenly Cuba has become a hot topic for that reason. Barack Obama’s article on U.S. policy toward Cuba sparked an exchange that shows how the perception that you need to stay hardline will make you defy all logic. Obama’s proposals were barely out of the mainstream—he favors the embargo, but just wants to allow a little more travel (though he did vote to cut funding for TV Martí). He wants to “empower” the Cuban people but this makes little sense, as the best way to empower them is to stop punishing them. Even that tiny deviation from the political norm, however, has the major candidates going crazy to out-hardline each other. ''Rudy Giuliani believes America must stand ready to help the Cuban people reclaim their freedom, but decreasing sanctions on Cuba will only serve to boost the Castro regime,'' said a campaign statement. Readers of this blog will probably already know that this is the one that gets me the most. The purpose of the embargo was to cut off the Castro government and thereby foster his overthrow. It is simply not possible to say that the policy has worked at all. In fact, there is no doubt that the embargo has helped Castro tremendously. The idea that decreasing sanctions would help him more requires incredible mental contortions to believe. The problem with this argument is that unilateral sanctions have secured power and repression more than unilateral concessions ever could. ''She supports the embargo and our current policy toward Cuba, and until it is clear what type of political winds may come with a new government -- if there is a new government -- we cannot talk about changes to U.S. policy,'' Clinton spokesman Mo Elleithee said. So she will wait for the political winds to make everything clear. Okeydoke. The other major Democratic candidate, John Edwards, said in a statement Tuesday that promoting travel by family members to Cuba ''can help spread the promise of freedom and democracy within Cuba and strengthen families across the waters.'' He favors the cap on remittances to use as leverage against the regime. So you let people travel, which spreads the “promise,” but you simultaneously use the deprivation of money as leverage against Castro. That, of course, is the logic of the embargo, and look how well that has worked. The mayor of London announced an agreement with the Venezuelan government to cut bus fares in half for the 250,000 least well-off Londoners. The scheme follows an agreement signed earlier this year by the Mayor, Transport for London and Venezuelan Oil Company Petróleos de Venezuela Europa. This provided a 20 per cent reduction in the price of fuel for London's bus fleet, which will be passed on to cut fares for some of the least well off Londoners. At the same time, London will provide Venezuela with advice and technical expertise in fields of city management in which London is a world leader such as transport, town planning, tourism and the protection of the environment. This particular type of diplomacy is ingenious, and has already been implemented in the U.S. First off, of course, it directly helps poor people, and by circumventing anti-Chávez governments (i.e. the U.S. and Britain) it goes to the local level, where people in need are more receptive. In that sense, it recalls Fidel going to stay in Harlem in 1960 and saying he was more comfortable there (no doubt he’s talked about that with Chávez). This also calls attention to the ways in which the poor are marginalized in “developed” countries, the message being that they require assistance that their own government refuses to give them. The policy is also almost impossible to deny—if the U.S. or British government finds a way to block it, then they will be directly hurting their own citizens who need help. He hanged till he was dead for he was ript whilst he did hang & being cut downe his members being cut off & cast into the fire, the Executioner ript him up and tooke his heart & threwe it into the fire which lept out againe & no man toucht it till the Executioner a goodwhile after threwe it in againe, his head and quarters were brought backe to Newgate & boyled & are to be set upon 4 gates of the Citty. Maybe I should put that right on my syllabi. A consultation of coca leaves by Aymara Indian shamans presages the recovery of Fidel Castro, according to Cuba’s ambassador to Bolivia. “The Comandante is enjoying a recovery,” Rafael Dausá, the ambassador, told Bolivia’s state news agency after attending the ceremony in El Alto, the heavily indigenous city near the capital, La Paz. Pointing to Cuba’s warming ties to Bolivia, as the leftist president, Evo Morales, settles into his second year in power, Mr. Dausá said, “Being in Bolivia today means being in the leading trench in the anti-imperialist struggle in Latin America.” Bolivia and Cuba, together with Venezuela, have forged a political and economic alliance called the Bolivarian Alternative of the Americas. "I don't want there to be any question in the American people's mind as to whether or not ICE would suspend enforcement efforts," Nantel said. "The answer to that is emphatically no." If the government is interfering with “actual enumeration,” then it’s not unreasonable to argue that it is violating the constitution. Via Vegreville: How to write an article manuscript review. 1. Skim the paper to get the basic argument. 2. Read the paper very carefully, making notes on things I do not understand, do not agree with, and technical details I need to think about. 3. Get away from the manuscript and think hard about it. 4. Convert the notes from step 2 into a list in a document that will be the ‘bones’ of my report. 5. Start writing a summary paragraph about the paper into that same document, and the summary paragraph will lead into my overall discussion of the paper in the report. 6. Edit the document into a coherent report. The final report includes a paper summary, a discussion of my overall views of the paper, and a page by list of questions and comments. 7. Get away from the report and think it over again. 8. Reread and edit the report again. 9. Write the letter to the editor. This describes my own approach pretty well. He says he might do numbers 6-8 many times, and that it takes a day or two. I’m not sure if I go back “many” times to the manuscript, as by the time I get to number 8 I have a clear sense of what I will be saying about it. I suppose it depends upon whether I immediately had a strong (either positive or negative) response. I also tend to start writing in prose more quickly rather than just making a list (as in number 4). There will indeed be a Spanish-language “forum” for Democratic candidates on Univisión. They changed the name to a “forum” so that Hillary Clinton could stick to her promise of only participating in six “debates.” That is fine, as they have been more like game shows than debates anyway. They have the full slate of Democrats for September 9, and plan a Republican one on September 16 as well, though I have seen only McCain accepting. As English-only proposals are currently hot for a number of Republican candidates, it is difficult to see them participating. Given the location, one part of the forum will likely be a contest to be the most anti-Castro. Just count how many times the word “tough” or a variant is used. Maletagate (already in full force at Wikipedia!) is moving right along. What has interested me in particular is the Venezuelan government’s reaction. The Minister of the Interior said that it was part of the “empire’s (US) objective of trying to tarnish and question President Chavez foreign policy." The Foreign Minister echoed the media argument, saying there are “elements” to suggest it is a plot against Chávez. These reactions just seem so unnecessary and even self-defeating. Why not keep it at “we’re investigating”? I have Nixon on the brain (I just read Woodward’s The Secret Man) but Nixon consistently did the same, to the point that not even his supporters believed him. Everything—even the things he was guilty of—was blamed on the "liberal media." Chávez has a scandal on his hands, and it might not end up being a disaster, or tied to him in any way personally. But even if you really believe they are at fault, it just seems like blaming it on the media and foreigners makes it look worse, not better. Will the War of the Pacific ever end? Bolivia, Chile and Peru just cannot shake the War of the Pacific. The Peruvian government published a map that gave Peru control over waters that Chile claims—the map’s line goes at an angle southwest while Chile says it goes out due west. Just as the war over century ago centered on natural resources (e.g. guano) so does this dispute (fish). As a result, the Chilean government has withdrawn its ambassador. 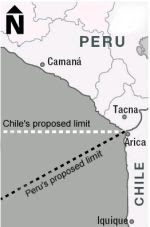 Chile claims the sea borders were fixed in the 1950s, while Peru says they never were and wants to go to the International Court of Justice to sort it out. This comes right after the Bolivian consul was recalled because he claimed Bolivia and Chile were having final discussions that would lead to a resumption of full diplomatic relations with, of course, access to the ocean. The Chilean government said he was not in a position to know much about the talks. Unfortunately, the presidents of all three countries face domestic problems, so all are happy to jack up the high political drama. But even under the best of circumstances, it’s no easy task to overcome well over a century of national bitterness and humiliation. Zogby recently released a poll on how U.S. citizens view U.S.-Latin American relations (see Boz and Randy Paul for discussions of some of the issues, such as the fact that almost no one has heard of Lula). There are two things that jumped out at me, especially given recent debates in the U.S.
First, despite all the nonsense surrounding the Obama comments on having discussions with “enemies,” 58% believe that the U.S. should hold discussions with Raúl Castro about the future relationship of the two countries. In addition, 56% believe the embargo should be ended. Second, despite all the talk of knowing “what Americans want” and therefore shooting down immigration reform, 55% believe the U.S. economy benefits from migrant workers. That and similar sentiments have been clear from many different polls in the past few years. The Bush administration announced new immigration proposals, 25 in all. There is the requisite “we’re keeping you secure” message—18,300 agents, 370 miles of fences, 105 cameras and towers, 3 UAVs (unmanned aerial vehicles), two French hens...The administration will even press “recalcitrant” countries to take back their immigrants. There is also a proposal to “review,” “streamline” and “institute changes” to the current H2A (i.e. agricultural) temporary worker program. Obviously, those terms are vague, but it could easily be viewed as an end run. Since Congress has refused to act, then the White House—which of course has years of experience ignoring Congress—will fiddle with the H2A program on its own. The number of workers allowed is set by law, so I will be curious to see what specific changes result. Or something like that. In Windham, NH there is a big dispute about a high school's colors and mascot. Turns out that said controversy was a great way to teach high school kids all about Latin American politics. The last quote, btw, is from the School Board Chairman. "Whether you're for blue or whether you're for green, we all should be for our democracy," said Cindy Hastings, mother of petition organizer Chip. Latizio agreed. "In our society, we can do this kind of thing," he said. "If we were in Venezuela right now, Hugo Chávez would be deciding the color and if you didn't like it, you'd be executed." A little over a week ago, I mentioned Kirchner’s trip to Mexico. Now Mexico is reaching out to Venezuela, reinstating the ambassador after a two year freeze as a result of Chávez’s criticism of Fox (the “lap dog” comment) and initial refusal to accept the results of the 2006 presidential election. Calderón also named a new ambassador to Cuba. Mexico has a long history of working with the U.S. while also maintaining relationships with countries (notably Cuba) with leaders the U.S. doesn’t like. So as Mexico negotiates a big anti-drug deal with the Bush administration, it will also strengthen its relationship with Chávez and the Castros. This is definitely a diplomatic win for Chávez who, as far as I know, didn’t back down from his comments yet still had Calderón come courting. My friend Mike had pointed out this article from the Council on Hemispheric Affairs on Chilean arms purchases. The upshot is that because of the law guaranteeing the military 10% of copper earnings combined with high copper prices, the military is buying expensive weapons, the government is therefore spending less on other, more important projects, while Chile’s neighbors are becoming more alarmed. The analysis is solid, though the overly alarmist tone is a bit much. For example, at the very beginning it says, “Is the Chilean military preparing for a new computer game: War of the Pacific: Part II?” and then never mentions it again. The author also suggests the army is just barely tolerating democracy—that may have been true 10-15 years ago, but not now. Nonetheless, the basic premise is right on. These weapons serve no legitimate purpose, the money should be spent in much better ways (even, as the author points out, for the rank and file as opposed to bling bling purchases) and given history, this makes Bolivia and Peru much more nervous and prompts them to spend money they might not have otherwise. The bottom line is the Copper Law. As Defense Minister, Bachelet announced an effort to repeal it, but was blocked by the right, which does not trust the Concertación to fund the armed forces. Interestingly, though, when I was in Chile in June I spoke to members of Congress—members from both the PPD and UDI said they thought a change would occur in the not-too-distant future. However, the ultimate formula may entail some sort of budget guarantee TBD. For now, however, the military can keep riding the gravy train. The news recently has been filled with congressional initiatives to punish employers who hire undocumented workers (complete with rah-rah quotes like “We are tough and we are going to be even tougher”). In addition, as of July 2 local governments had introduced a staggering 1,404 pieces of legislation related to immigration. This brings several things to mind. First, this is a huge test for whether all the pro-immigration rallies can translate into political influence and resist the anti-immigrant tide. I have my doubts, but perhaps I am wrong. Second, it also a major test for enforcement-only advocates. We will see whether the “pure punishment” strategy works as claimed. Third, capitalism is humming along in the opposite direction, oblivious to the political bluster. Just in the Charlotte area, there will be a new Latino-themed mall, there is Mexican rodeo, aisles in every supermarket are well-stocked with Mexican food products, small markets and restaurants (of all different types) thrive, while Bank of America and insurance companies offer loans and policies without requiring a Social Security card. In the South, this is a new phenomenon. Businesses no longer look at the immigrant population solely in terms of labor, but rather also as an almost entirely untapped market. I'm serious, that is a real headline. The article discusses a very perplexing situation. The Cuban VP called up Hugo Chávez’s "Aló Presidente" show and said Fidel was working very hard and loved the show. But why didn’t Fidel call himself? Is it because he’s already dead? Is this all a Cuban remake of Weekend at Bernie’s? Inquiring minds want to know. The article continues with Raúl’s daughter admitting, to the shock of all, that Fidel may not live forever. Barry Bonds now has 755 homers and soon will break the record (on a side note, he hit number 755 against the Padres but we swept the Giants so I didn’t mind too much). I’ve found myself viewing Bonds and the record with indifference. I don’t hate Bonds, but he’s not very likeable, not to mention the steroids accusations hanging over him. In other words, he’s no Tony Gwynn. Or Hank Aaron, for that matter. But I also think that Bud Selig has acted liked a dope (no pun intended). Watch the video of Bonds’ home run and you see him standing there, hands in pockets, as if he wasn’t even paying attention. Now he says he’s going home and won’t be around for the Giants’ next few games. What pressing matters does he have? I think Bonds took steroids (see Game of Shadows, which summarizes all the evidence) but I don’t hate him for it, and I think Selig should give the record more attention, especially since Bonds has not been convicted of anything. But that cloud, combined with his personality, just leaves me much less interested than I otherwise would’ve been. Regardless, this may be a short-lived record. A-Rod just hit his 500th, the youngest person ever to do so (he only just turned 32). North Dakota joins the growing list of U.S. states promoting trade with Cuba, with 100 tons of seed potatoes. I wrote a few months ago about how Nebraska (which, incidentally, also has a Republican governor) placed a priority on Cuba, as did Alabama. Idaho is also making a big push, as its governor traveled to Cuba in April (though Idaho may well be miffed that ND got a potato contract). Simultaneously, we have all these farming states wanting more access to Cuba, while Raúl advocates more dialogue. But to what degree can these governors make any changes in their own party’s official view of Cuba? Chilean authorities finally caught General Iturriaga, who had been hiding for over a month. Turned out he only went as far as Viña del Mar, which is very close to Santiago. This came right after the army announced various measures intended to show its unhappines with his flight, and I would guess the timing is no coincidence. He really overplayed his hand, and his failure to rally more than token support is a good sign for civil-military relations. I was asked by Carlos Sandoval García, the director of the Instituto de Investigaciones Sociales at the Universidad de Costa Rica to help publicize their new blog, which they hope can be a forum for debating whether or not to ratify the free trade agreement (i.e. CAFTA-DR). There is a referendum on October 7. The blog also has links to a number of different videos, academic works, official declarations, press accounts, etc. Kathryn Sikkink and Carrie Booth Walling, “The Impact of Human Rights Trials in Latin America.” Journal of Peace Research 44, 4 (July 2007): 427-445. Abstract: Since the 1980s, states have been increasingly addressing past human rights violations using multiple transitional justice mechanisms including domestic and international human rights trials. In the mid-1980s, scholars of transitions to democracy generally concluded that trials for past human rights violations were politically untenable and likely to undermine new democracies. More recently, some international relations experts have echoed the pessimistic claims of the early `trial skeptics' and added new concerns about the impact of trials. Yet, relatively little multicountry empirical work has been done to test such claims, in part because no database on trials was available. The authors have created a new dataset of two main transitional justice mechanisms: truth commissions and trials for past human rights violations. With the new data, they document the emergence and dramatic growth of the use of truth commissions and domestic, foreign, and international human rights trials in the world. The authors then explore the impact that human rights trials have on human rights, conflict, democracy, and rule of law in Latin America. Their analysis suggests that the pessimistic claims of skeptics that human rights trials threaten democracy, increase human rights violations, and exacerbate conflict are not supported by empirical evidence from Latin America. Sikkink is a major scholar of human rights issues in Latin America, and this article is particularly interesting because I do think that the “undermine new democracies” argument had largely become conventional wisdom, yet analyses have not used any sort of dataset. The authors refer to a “justice cascade” where there are multiple avenues like truth commissions, trials, reparations, archives, memory sites, etc. which actually strengthen democracy. Human rights trials can have a positive effect on rule of law, as they increase interest and attention on the judiciary. All the talk of building a border fence to keep Latin Americans out of the country may well contribute to closer relations between countries in the region. No matter their differences, they can all agree how insulting it is. So, Kirchner was in Mexico and gave a speech to the Mexican Senate criticizing the wall. At the same time, he was negotiating an automotive free trade agreement with Calderón. The former would certainly contribute to getting the latter passed by Mexican lawmakers.